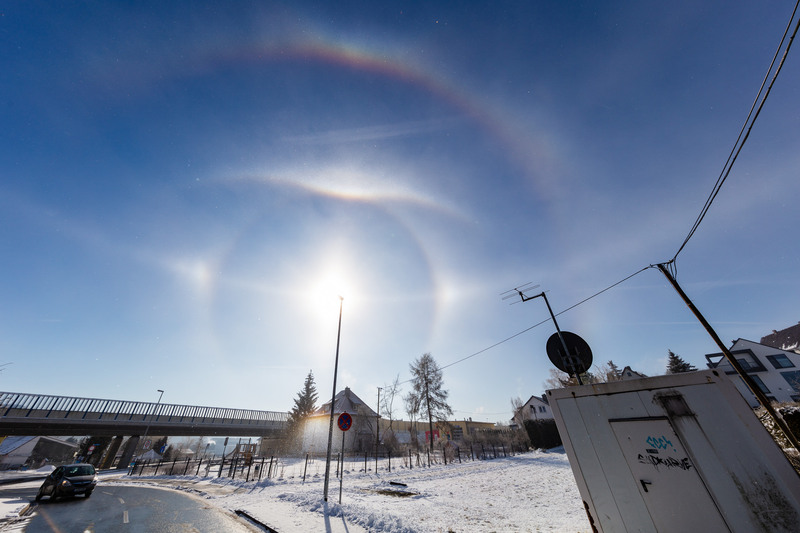 If the light is refracted and reflected by ice crystals, a visually (mostly weak) distinctive halo can become recognized. 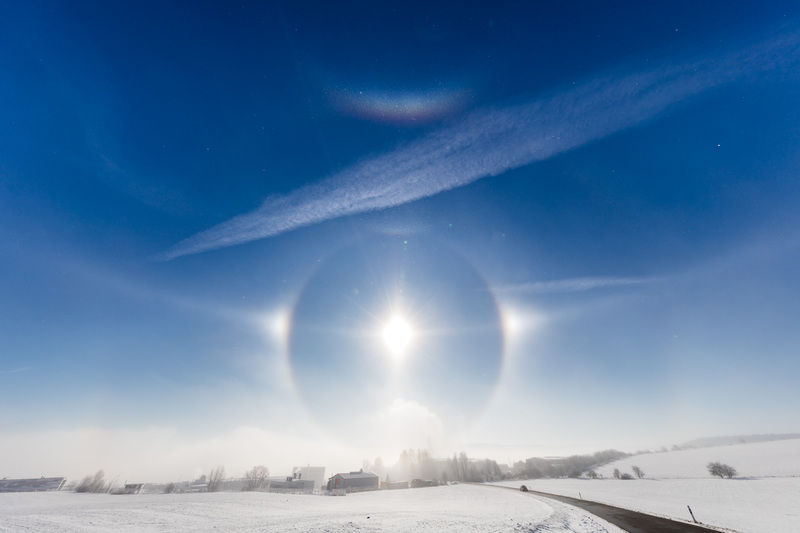 If it is not observed on higher clouds, diamond dust (= ice fog) is usually the reason (exception: on blankets of snow). In general, the observation around Jena-Maua is very difficult. 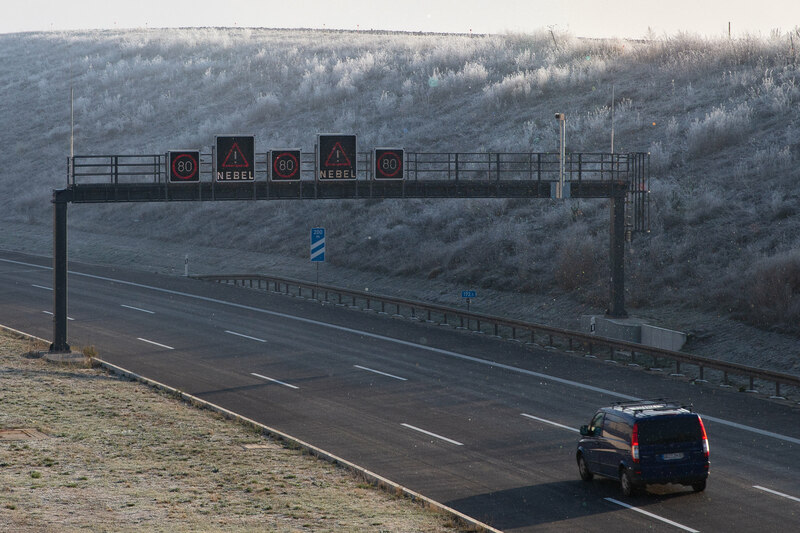 The new built passage of the B88 with traffic circle and autobahn entrance/exit roads represents a barrier. Quick changes of location are hardly possible. 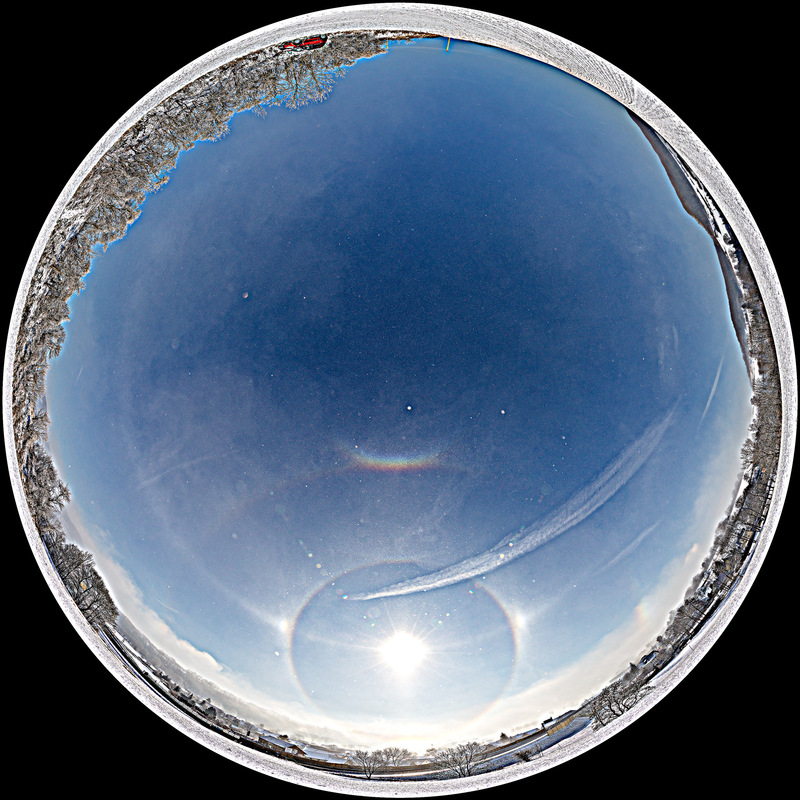 The next observation succeeded then at about 10:20 a.m. with a sun height of approx. 14°. 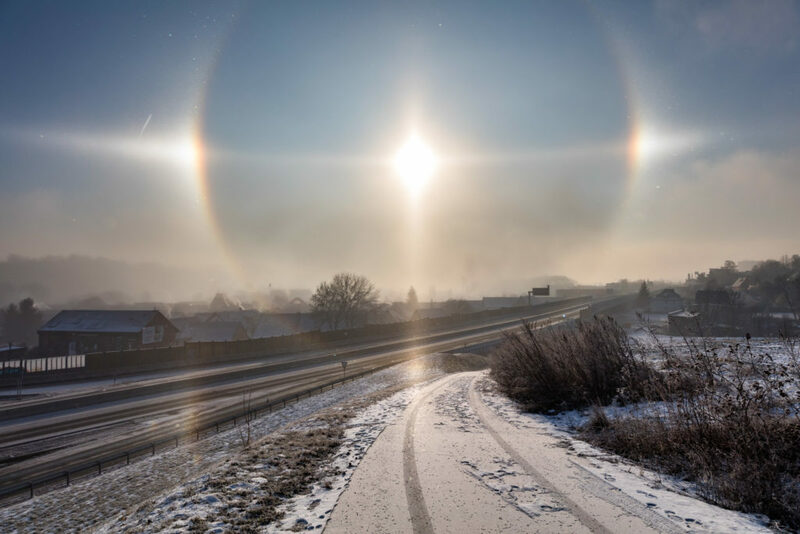 The light cross in front of the sun became very clear. 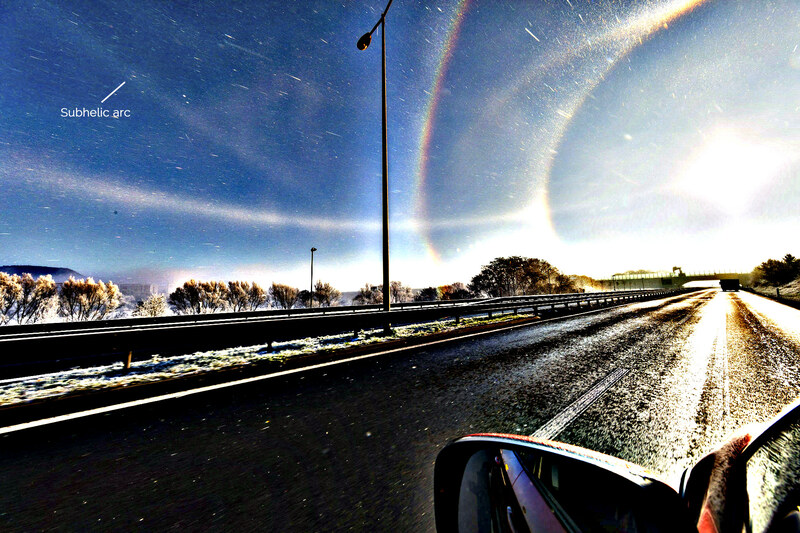 The whole halo was quite impressive. I had never seen anything like that before. What a view on the way to the job site! 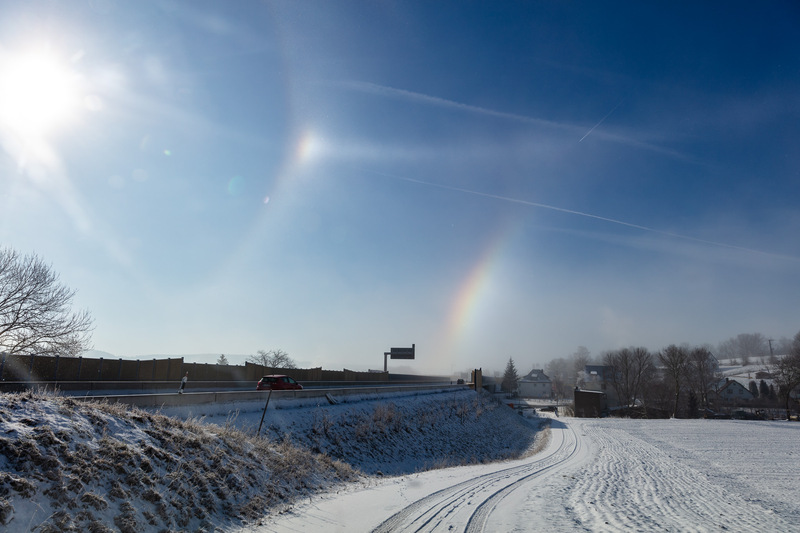 At the end about 10:35 a.m. (sun elevation 15°) the halo phenomenon showed its full beauty in Maua. 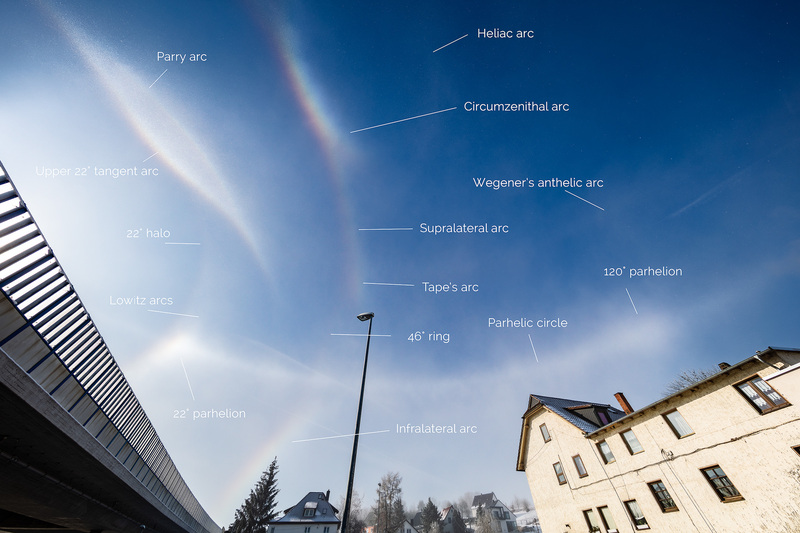 Additionally, the Parry arc, Tricker’s src, Subhelic arc and more came to light. 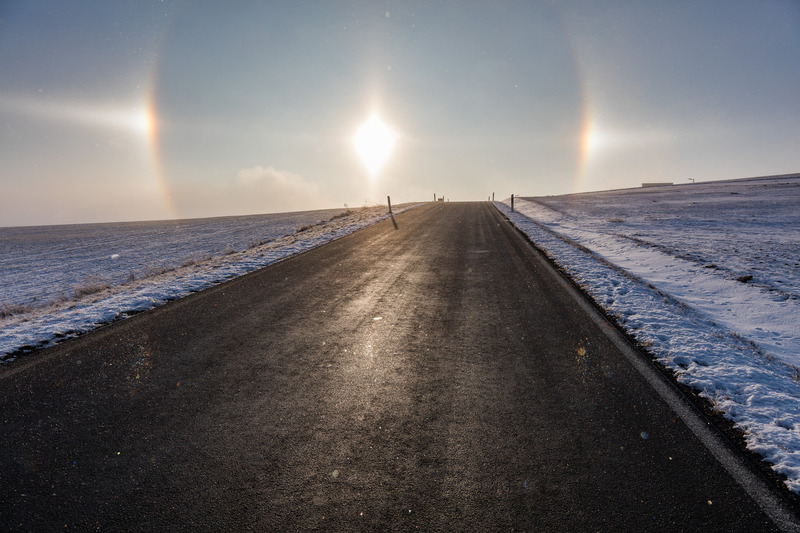 Claudia Hinz and Andreas Möller have contributed significantly to the determination of the halo types – thanks so much! I also owe the panorama calculation to the latter. More about this and the topic in general in the AKM e.V. 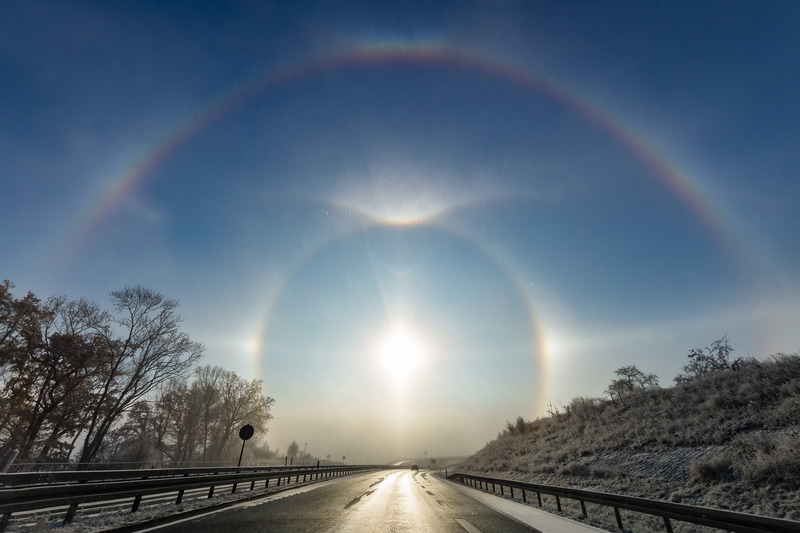 forum (German speaking) / Halo-Blog.net (English version) or the Finnish Halo-Blog. 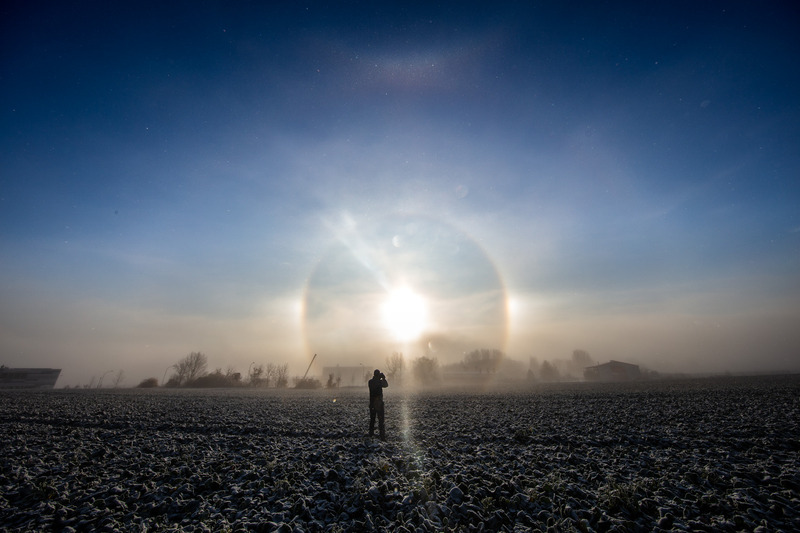 Diamond dust in Central Germany? Wasn’t that a phenomenon of mountains, snow slopes and the Arctic? Well, the temperature (= dew point) moved between -10 degrees and -6 degrees in the period from 7:45-10:45 a.m. – with a relative humidity of over 95%. That’s quite good! 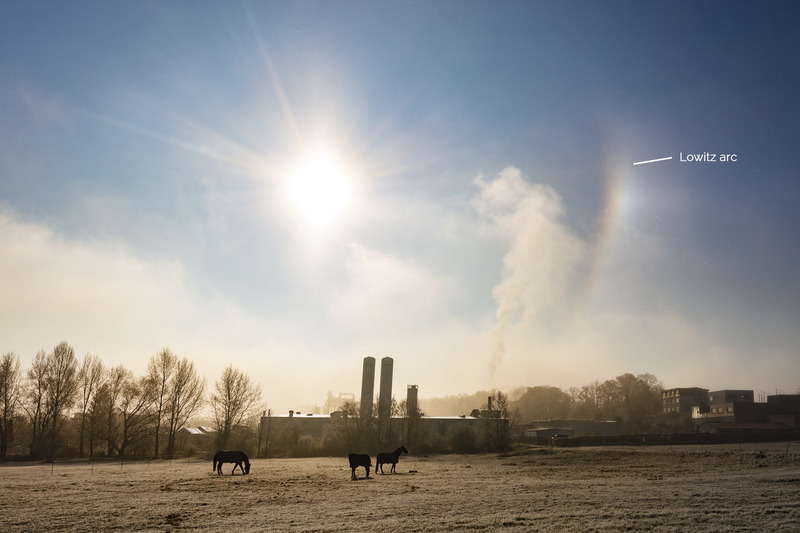 The formation of the haloactive diamond dust in such a small area (Jena-Göschwitz, Jena-Leutra and Jena-Maua) is supported by the assumption that industrial chimneys release fine particulates as the necessary sublimation nuclei for condensation. 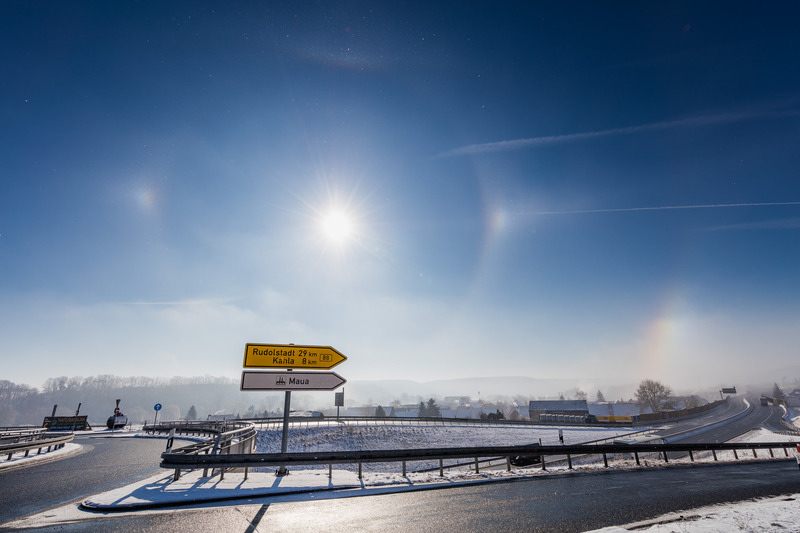 By surrounding the area, the origin of glittering ice crystals can be traced back on the basis of wind direction to Jena-Maua.Well – this was just the beginning. Diamond dust was visible during the night at my home in Jena-Burgau. 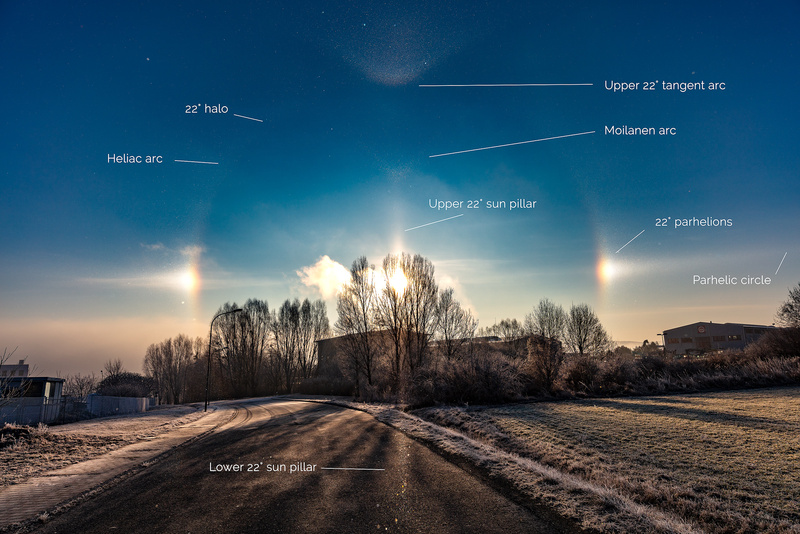 So I went to my “backyard” mountain and saw the first halos with a sun height of about 7° and a temperature of -2°C. 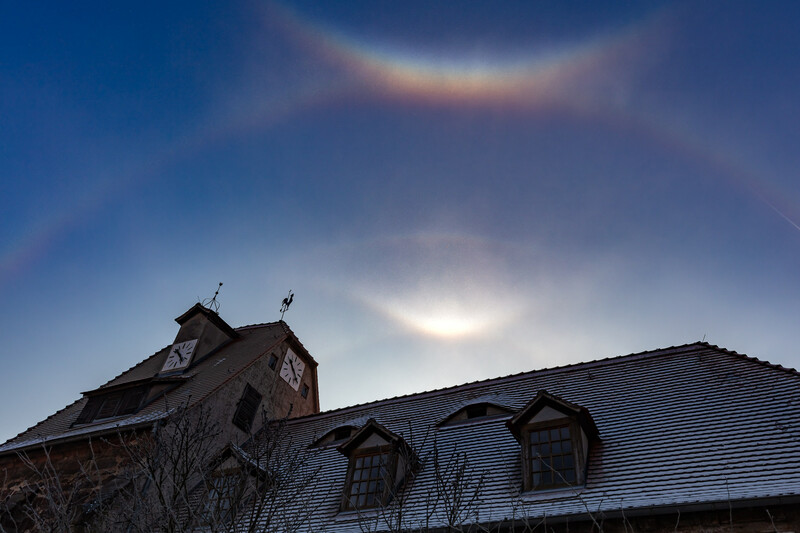 The second image showed an interesting area below the circumzenithal arc. While the AKM e.V. 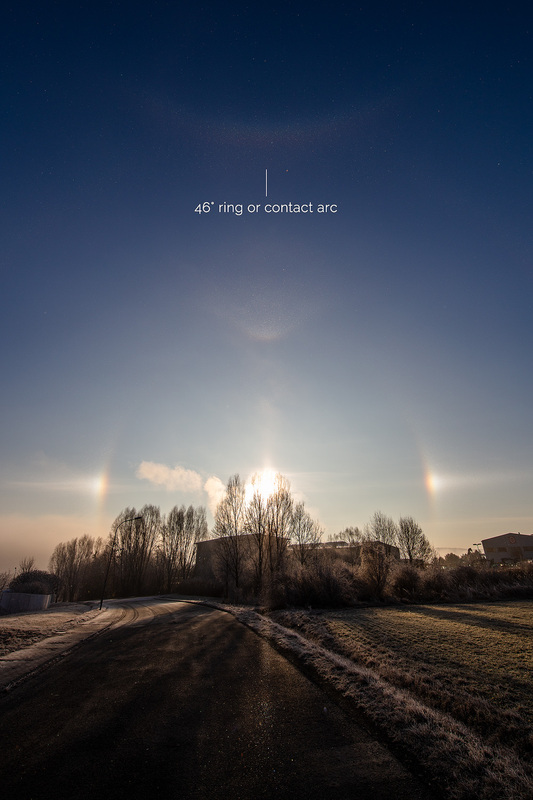 sees it as a 46° ring the Finnish researcher Riikonen sees a contact arc there. Who know’s. On March 21st 2018 – yep, we had a late winter! 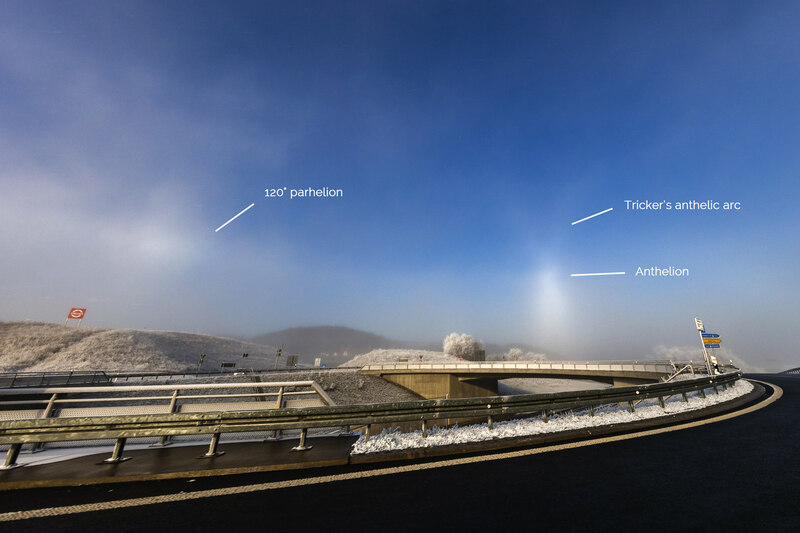 – I was documenting another diamond dust display between 9:45 (sun height 29°) and 10:15 (sun height 32°) a.m. in and around Jena-Maua. It is hard to believe but the 2m temperature was between -1°C and +2°C at that time and relative humidity around 70% / dewpoint about -6°C. Surprise – surprise. If you want to see a contrasted version for further determination, see the unsharp masked timelapse video. Make sure to watch it in 4K-Resolution. 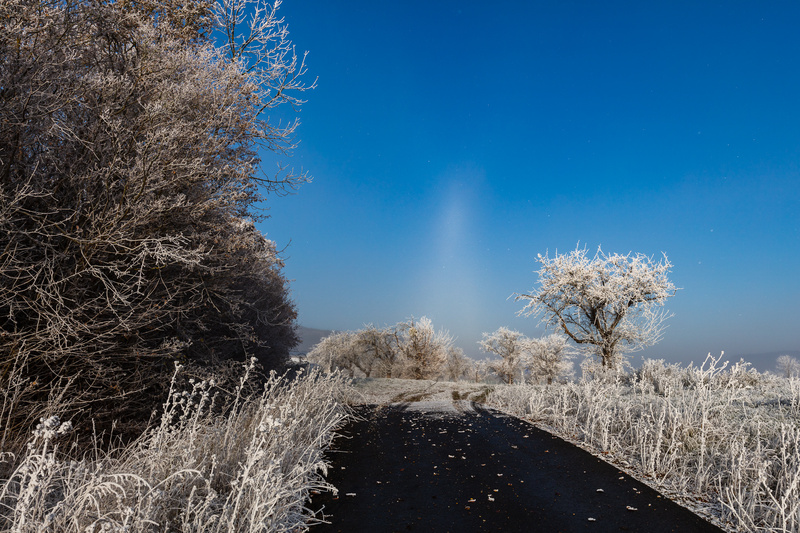 After flying with the drone over the foggy Saale valley there was a small chance left for diamond dust. 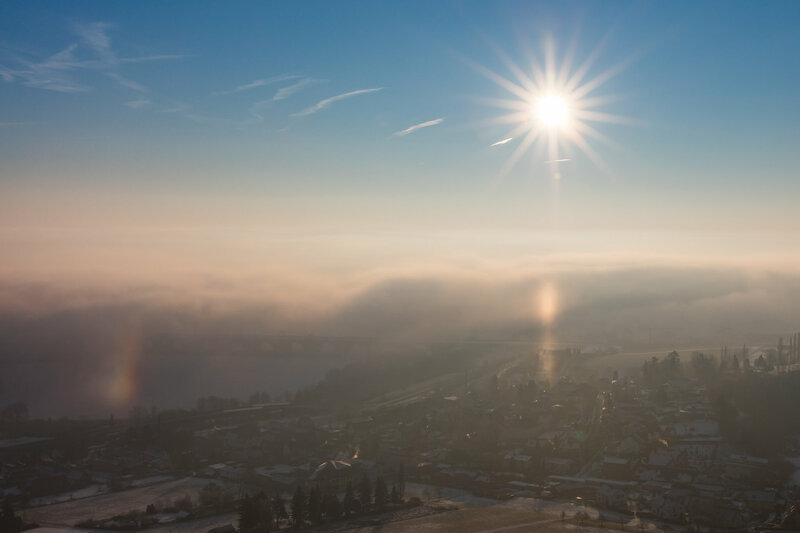 Time: 09:00 (sun angle 10°) – 10:45 (sun angle 18°) AM CET – 2m Temp: -1 / +1°C – Rel. 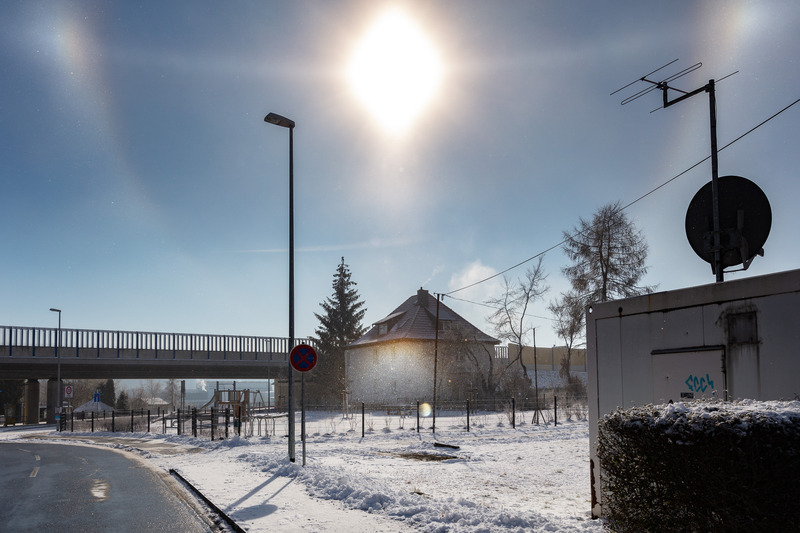 Humidity: 90% – dewpoint: -2°C (Sources: TPE / Kachelmannwetter.com). 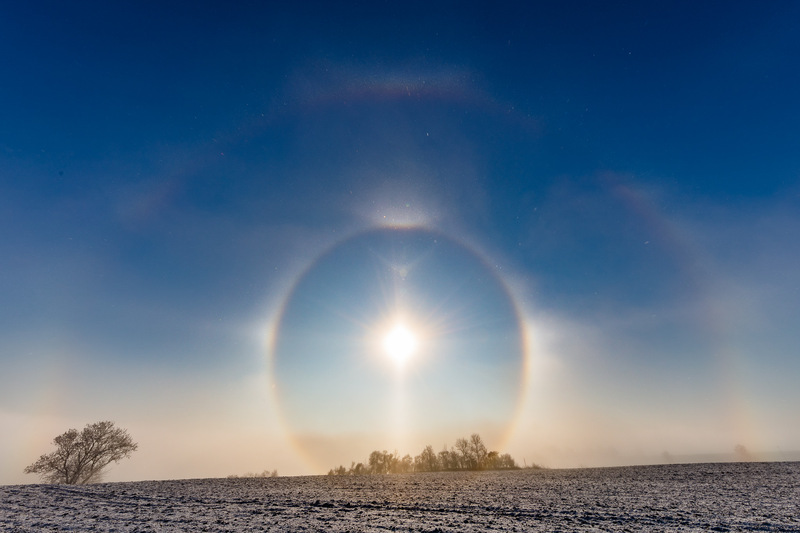 Since the actual fog shadowed the sun there was no distinct halo display. When it dissolved more and more … the magic started. 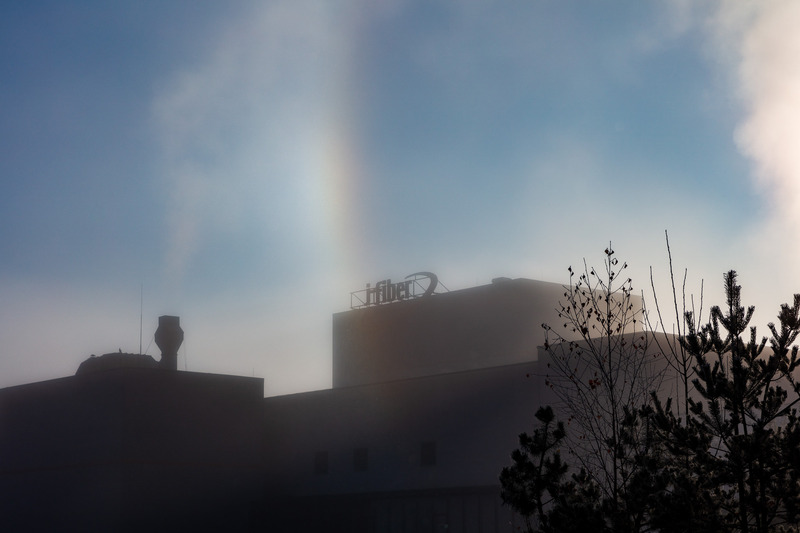 Halo next to the chimneys of »j-fiber« – a fiberglass production company (in Jena-Maua). 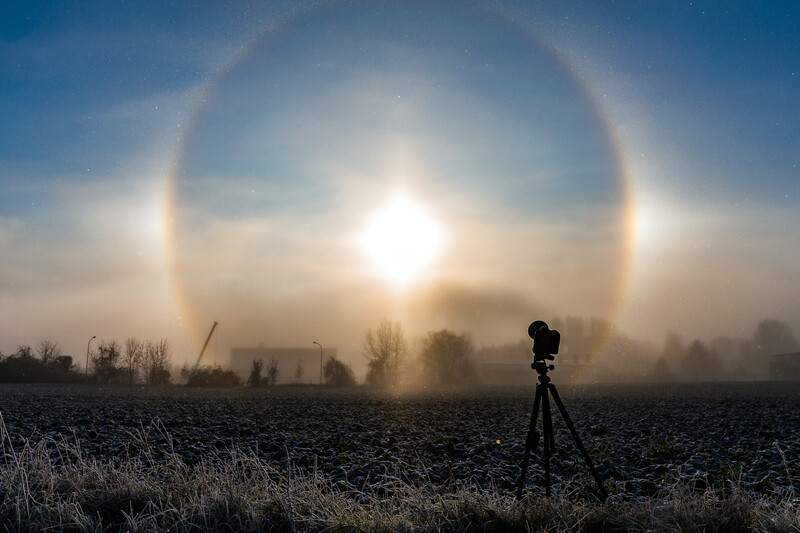 By far the best diamond dust halo after the first sighting back in January 2017 was Nov. 17th 2018. 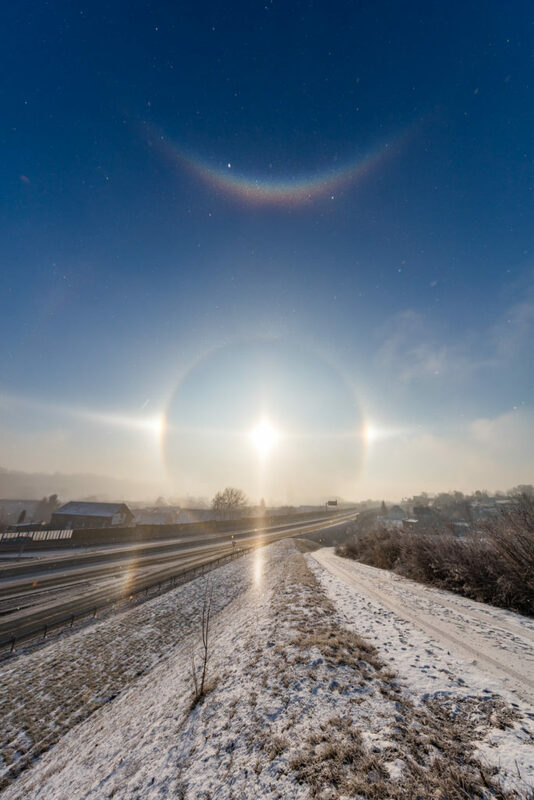 Time: 10:50 (sun angle 18°) – 11:50 (sun angle 20°) AM CET – 2m Temp: -1 /+2°C – Rel. 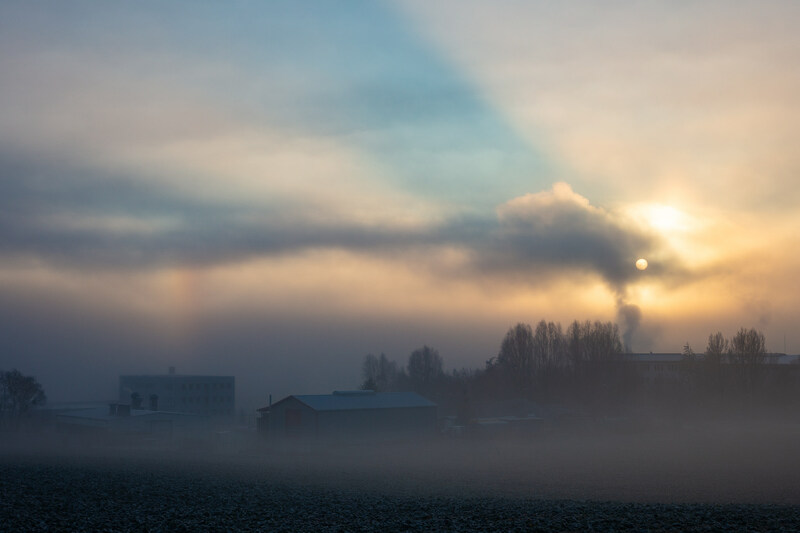 Humidity: 90% – dewpoint: -3/-1°C (Sources: TPE / Kachelmannwetter.com). 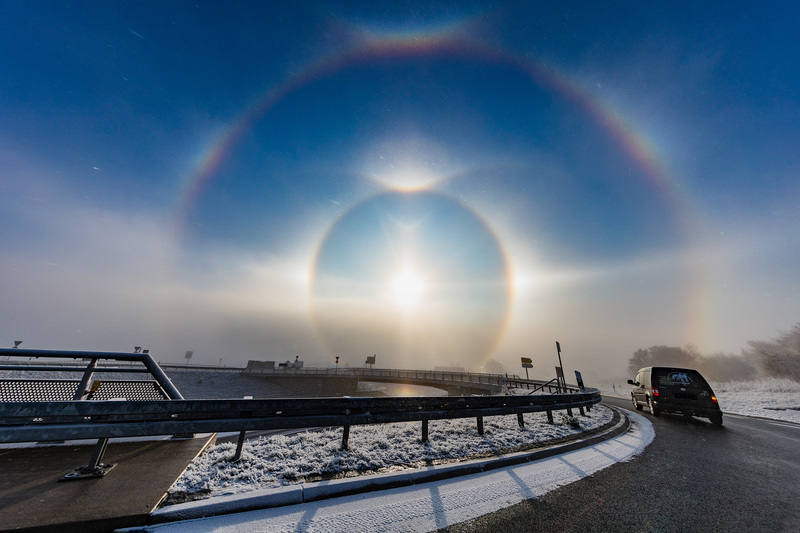 Encountering such beautiful phenomena of nature makes me feel a deep peace in life. What a view! 14 halo types at once. Watch the timelapse documentary below. With 2:10min video begins again as unsharp masked version for a better contrast. First of all: without the knowledge and help of the German Arbeitskreis Meteore e.V. (short: AKM) these sightings wouldn’t have happened at all. 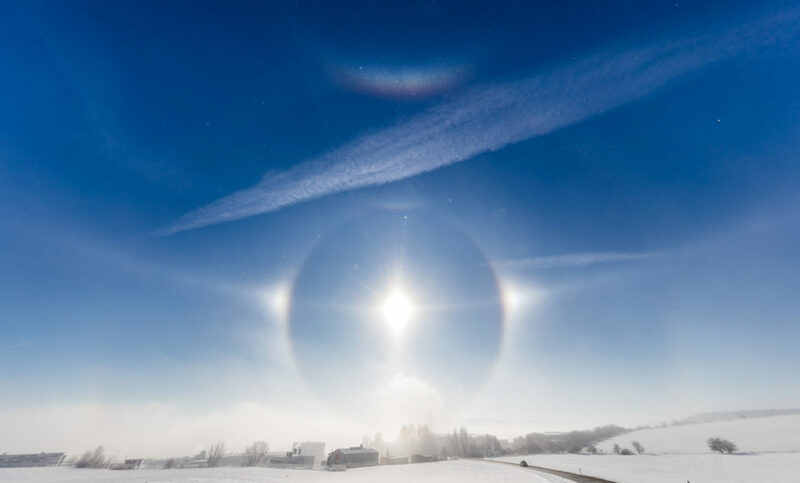 Especially the presentations of Claudia Hinz ignited my fascination for atmospheric optics which is now as strong as my dedication for weather in general. What do all these sightings have in common? Relatively temperature independent appearence? 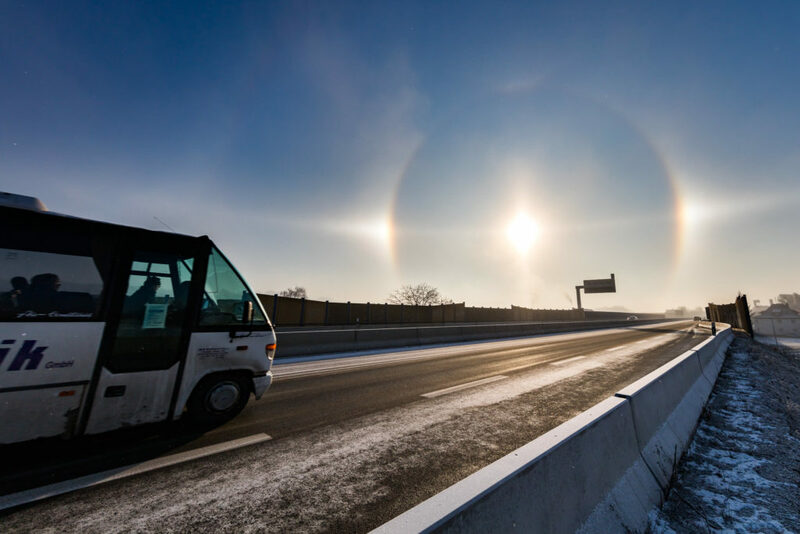 2m maesurement in Jena varied from -10°C to even +2°C with a relative humidity range of 70% to 100%. 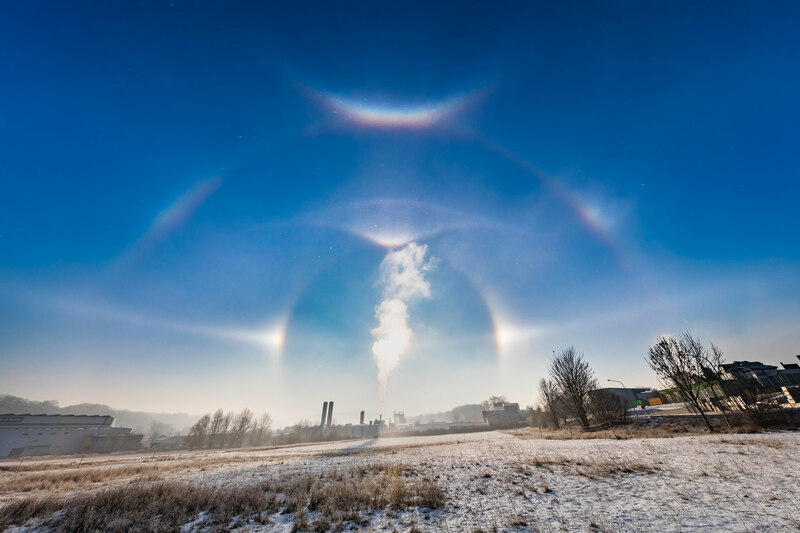 The correlation between the ejections of industry chimneys as a precondition and the diamond dust formation seems legit. For the next displays exact on-site measurements are necessary to describe possible contortions. 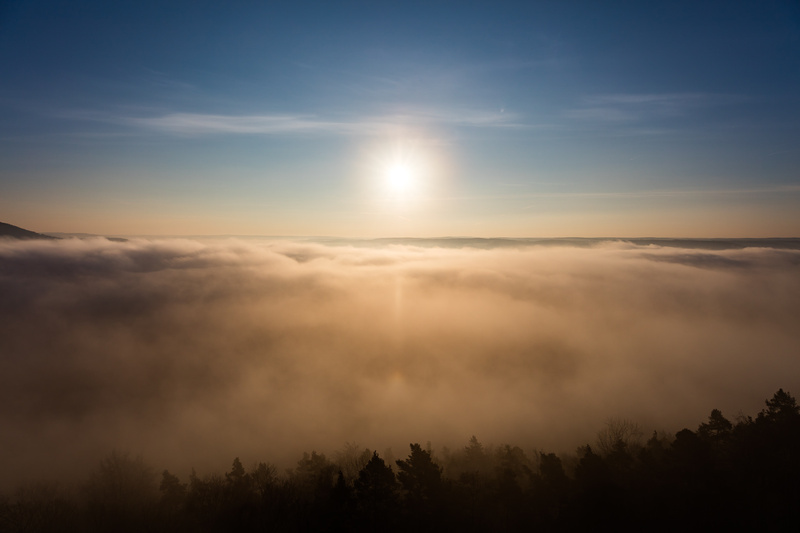 The official Jena 2m temp in the city might be a few degrees higher than close to the fog boundary. Even if I locate a hotspot in Maua the diamond dust has been spotted Saale upriver in central Jena. There might be other yet unrecognized factors or industries contributing to that phenomenon. Any further documentations will get their own blog entry. For now this is the summary of all personal sightings in the last two years (2017-18) concerning diamond dust. If you’re from Jena and witnessed halos aswell feel free to leave me a message with the dates you saw them.